Also called Karakachan Pony, Karatschai pony, Karatschaever, Karatschaewsker & Karachaier, the Karachai breed comes from the breeds of the northern Caucasus and was developed at the start of the last millennium. 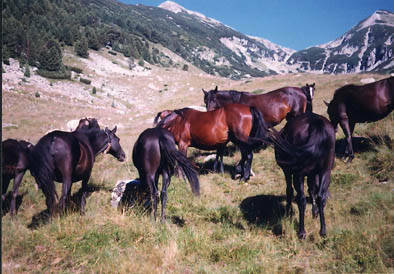 The breed comes from a mix of southern, steppe & eastern horses and is very similar to the Kabardin breed. They are hardy and true animals that have survived a very long time, until the 19th century when their numbers declined. In fact, surveys done after the second World War showed that the Kabarda & Karachai breeds are the only two northern Caucasus horse breeds that survived. In the aftermath of the war programs were established to regenerate both of the breeds and a great deal of crossing was done between them (with a limited amount of Thoroughbred blood peppered in). In 1935 the first studbook was created for the mountain breeds, although the Karachai numbers were notably lower. By 1942 the Karachai breed had officially been absorbed into the Kabarda breed as their lines were so entertained. However, the Karachai bloodlines are persistent and some provinces preserved pure lineage despite official absorption. Fortunately the breed has once again been recognized and have since been studied closely to determine their true type. Basic type – Saddle-harness type, most closely exhibits the breeds characteristics & often have Thoroughbred influence. Do you have images or know more about the Karachai breed? I’d love help completing this page, please contact me to get involved.